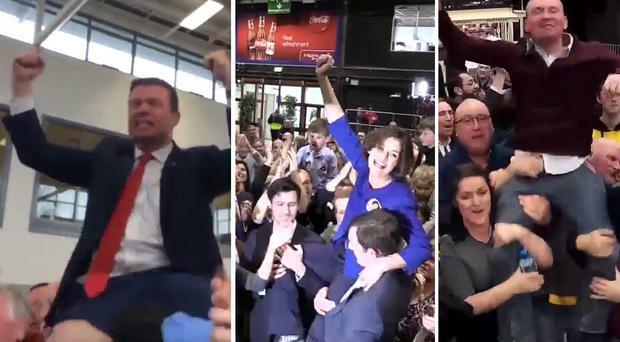 WATCH: Some of these great celebratory hoists of GE16 will really . . . pick you up! Independent candidate Averil Power has requested a recount as she faces elimination in the Dublin Bay North constituency. The Healy-Rae victory tour is winding its way around the Kingdom, taking in every village and town en route. Sinn Fein leader Gerry Adams says his party is on "continued election standby". Now this is passion! His prayers have been answered, Alan Kelly's reaction after being re-elected. Michael Ring is the 2nd person to be elected in Mayo. VIDEO: What's it really like inside the RDS Count Centre? Our Social Media Editor Clare Cullen takes a look at what it's really lilke to spend your day in a count centre. On day two of the count, The Floating Voters discuss the young vote, Joan Burton’s latest challenges and whether the media got it wrong. OUTSPOKEN Fine Gael backbench TD Jerry Buttimer, who faces losing his Cork seat, has launched an impassioned defence of Taoiseach Enda Kenny. TAOISEACH Enda Kenny intends to stay on as leader despite his party's disastrous election. Niall O'Connor and John Downing discuss the latest news right from the RDS Count Centre. Minister for Transport Paschal Donohoe admits that he has a tough fight ahead in Dublin Central. Impromptu singalong at the RDS for Mary Lou McDonald and the moment she was elected. IN THE postmortem on its disastrous general election campaign, the euphemistic 'strategy' will doubtless be discussed by Fine Gael. Social Democrats candidate Roisin Shortall has topped the poll in Dublin North-West, well ahead of her nearest rivals. Dearbhail McDonald interviews Mary Lou McDonald at the RDS. Former Junior Minister Joe Costello has conceded that it's most likely his seat is gone in Dublin Central. INM's Business Editor Dearbhail McDonald chats's to Fianna Fail candidate Sean Haughey, who is set to take a seat in Dublin Bay North. Broadcaster George Hook has declared Enda Kenny as a “dead man walking” and endorsed Michael Martin as Ireland’s new Taoiseach. Fianna Fail councillor John Lahart topped the poll iin the Dublin Bay South constituency, which had the most candidates. 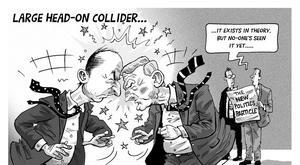 Independent.ie's Kevin Doyle and John Downing discuss the rise of the Social Democrats live from the RDS count centre. Independent.ie political team react to early indications that the current government is in crisis.